"You don't have to live with nothing to be a good person, but once you've seen people suffering, how can you not remember it all the time and do something toward making things better? How can you not do something?" We got up early one morning and set out on an eight-hour journey into the hinterland on some pretty rough roads. There were miles and miles of rice fields and every so often we would come across a village of rural people living in houses built on stilts. We saw water buffalo, cows, dogs, pigs, ducks and chickens. Sometimes I felt like I was driving down an old dusty road in the state of Iowa instead of Cambodia until we started seeing the extreme poverty and all of the people missing limbs. We visited five villages in the Mong Commune where our wells were built and cried the first time we saw the Landmines Blow!® sign. It had been a long journey from an idea born in a home office in Lombard, Illinois. In one village when we pulled up in our truck a woman came running out of her house and grabbed me and gave me a big hug. 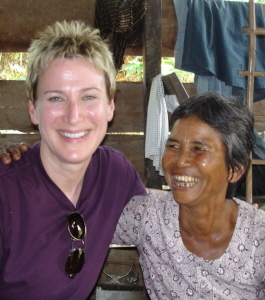 She was so excited and speaking so fast in Khmer that the driver had a difficult time understanding her. We learned that her name was Lee Ang. She was 58 years old and never had access to clean water in her whole life. She was delightful and animated and laughed and smiled a lot and reminded me of my Grandma in some odd way. She never left my side and squeezed my hand as she showed us around her village. Who Knew How Significant One Well Could Be? We learned about how she had lived through 30 years of war and the Khmer Rouge and the genocide. Her village never had access to water so the children had to walk for miles through a countryside littered with landmines just to get a couple of pails of water that were often contaminated. It was very heavy to carry and the babies often got sick after drinking it. But now she had a big beautiful well practically in her own backyard and it was delivered by a woman! She could not wait to tell her friends because the well was going to be governed by women in the village and she was going to plant vegetables and watermelon to sell at the market. The children could go to school and soon they would be able to get water buffalo and plant rice. She asked me to marry her son and wanted to know how my hands stayed so soft because she spent many years working in the rice fields and her hands were very rough. We took some pictures together and had lunch - a story in itself. Having a clean water well in the village means that more children can go to school, there will be a decrease in the number of landmine accidents, people can earn money and babies have a better chance of living past the age of five. When it was time to leave, I turned to the driver and said, "Who knew how significant one well could be?" 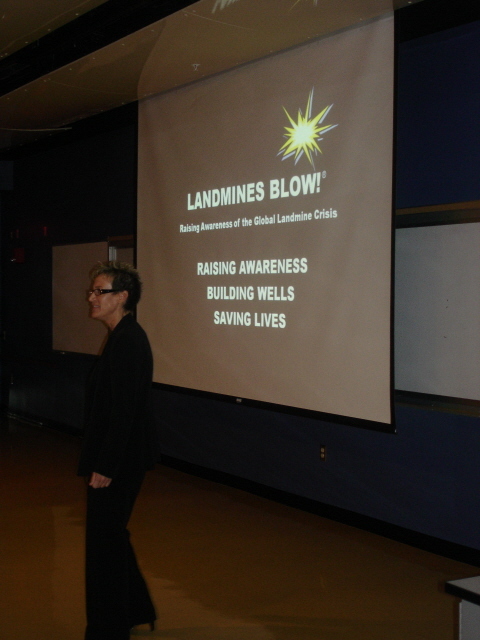 Landmines Blow!® is part of the solution to assisting survivors and rebuilding mine-affected communities. Acre by acre, child to child the threat of landmines, cluster bombs and water borne illnesses can be eliminated. We believe that it is our responsibility as members of civil society to fight for democracy and human rights, to insist that all human beings are treated with dignity and respect, to ensure the equal distribution of the earth's resources and to promote a culture of peace. We offer a grass roots outreach campaign designed to raise awareness, enlighten and educate civil society. Topics include landmines, cluster bombs, the water crisis, global health, the empowerment of women and volunteerism. We present at schools, organizations, socially responsible businesses, associations, clubs, groups and churches. 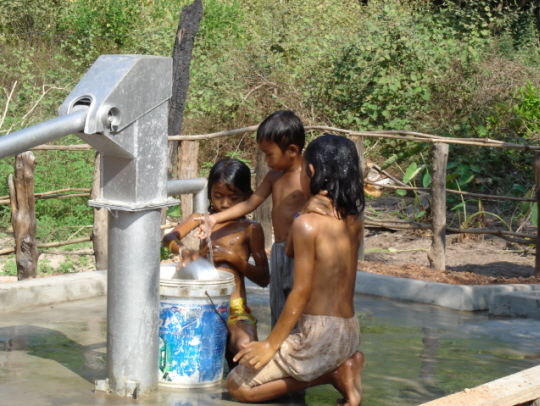 For about $1,500 USD, we are able to build a well that provides clean safe water to mine-affected communities. 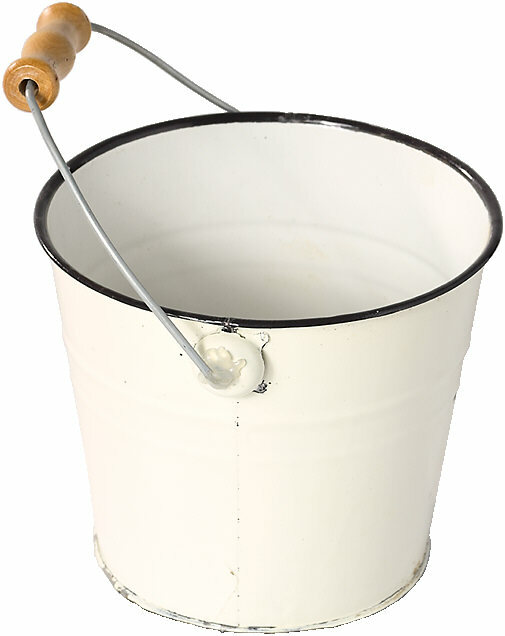 We use Afridev pumps which are very durable and can stand up to extreme weather conditions. Domestic hygiene training, well maintenance education and ongoing water testing is included in the cost of the wells. This investment in education and maintenance helps to ensure sustainability.